This past weekend, BBQ50 made its maiden voyage to Rockledge, FL!!!! We’re talking ’bout 50 minutes east of Orlando, on the way to Melbourne. Felicia prepared a dozen, slow smoked, baby back ribs for my buddy, Dan, and his family and friends for a fun, friendly Saturday afternoon BBQ. We also hauled 45+ pounds of slightly sweet, and slightly spicy, pulled pork, along with 30+ pounds of traditional Texas brisket! I’m talking about brisket that is lightly seasoned with sea salt, cracked black pepper, and smoky paprika…..just enough rub to draw a definite pink, smoke ring around pencil thick, juicy slices of Grade A Beef!!! The party didn’t come without its challenges. Since we cook to order, and deliver the minute it’s fresh, we had to start early afternoon on Friday. We don’t believe in pellet smokers at BBQ50. 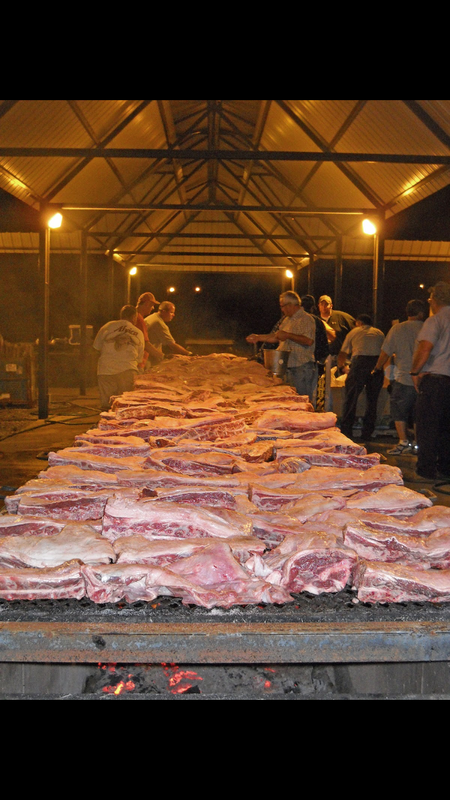 We will always smoke meat like my granddaddy did….hardwood logs and lump coal. It’s an art to master the elements, wind, rain, air flow, in order to deliver the best product you can. It’s all about the results when it comes to what you are putting in your belly! Your mind will always bookmark what your tastebuds react wildly to. If it brings a smile to your face when you sink your teeth into it, your brain won’t let you forget it. Our goal at BBQ50 is just that! Bring that smile to your face enough to create a craving for it!! Like I was saying, since we cook to order, we started the fire at 4pm the day before. It’s a 16 hour smoke when making brisket. It’s not a bad Friday night when you get a handful of friends to swing by with chairs, a little music, a little cold somethin’ to swish, and an arsenal of stories and bullsh*t to rap around the circle for a few hours. It was a windy evening, as a warm front was coming in. The wind continued at a steady 10-15 knots, with gusts of 20 mph. The fire was strong in the early innings, hut needed some help. Around 3am, we faced our toughest challenge. The fire had gotten low, but, Miss Felicia held strong. Her iron shell kept at a solid 225 throughout the night. We dropped the temp down to 180 for the rest of the morning while the ribs and butts finished up. By noon, we were on the road!! Thank the Man for Cambros!! This little number I have carried 85+pounds of holy moly goodness to Dan’s new digs! The Cambro kept the food as hot as it was when it came off the smoker! So pleased!! I am so thankful Dan trusted BBQ50 to cater his first house party!! If you are interested in a finger licking, lip smacking, best in east Orlando BBQ, give us a shout!!!! Until next time y’all!! See you around the smoker! !